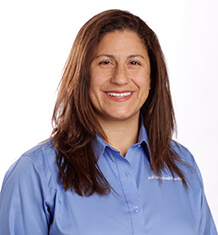 Robin’s career in Physical Therapy began in 1999 in New York City, treating patients at the prestigious Rusk Rehabilitation Institute and joined MTI Physical Therapy in December of 2003. She specializes in the treatment of orthopaedic and sports related injuries. She has training in women’s health issues, including female pelvic floor weakness, stress/urge incontinence, and pre and post-partum dysfunction. Robin is a member of the legislative committee of the Physical Therapy Association of Washington (PTWA) and was elected Vice President of the PTWA in October of 2014. She is a key player in protecting the broader health care needs of her patients and community, locally and nationally. In college, Robin was member of the Albany State Women’s Rugby Club, and as such is very knowledgeable in sports-related injuries. Since College, Robin has completed four marathons and a sprint triathalon. Robin has volunteered at the New York Marathon providing emergency medical care as part of the triage team for runners at the mile 16 first-aid station. Professionally, she uses her skill and experience to identify and treat runners who encounter pain and poor performance due to diagnoses such as plantar fasciitis, bursitis, and back pain, by assessing faulty biomechanics, and subsequently educating patients for proper training. In 2011, Robin successfully climbed Mt. Kilimanjaro, and completed The Mountaineers Basic Alpine Climbing Program in 2012. Additionally, Robin is an avid runner, and skier, and loves to hike the Olympic and Cascade Mountains locally. Editor, Rivard J, Grimsby O., Scientific Theory and Clinical Application in Orthopedic Manual Therapy. 2008 (http://lulu.com). Volumes 1-3.